London - Liverpool will officially unveil the newly named Kenny Dalglish Stand at their match with fierce rivals Manchester United next week, the club said on Friday. The Premier League giants announced that Anfield's Centenary Stand would be renamed the Kenny Dalglish Stand earlier this year to commemorate the player's contribution to the club both on and off the field. Dalglish, 66, won multiple league titles and three European Cups during a glittering 13-year stint as a player and in two managerial tenures. A special mosaic will be revealed across the stand and the Kop ahead of kick-off on October 14 and the matchday programme will feature a cover dedicated to the former player and manager. "It is testament to Liverpool's history and status that we are not lacking in truly great individuals, whose names could easily grace a stand at Anfield," principal owner John W. Henry said earlier this year. "But in Kenny Dalglish we have a person who carries such immense significance to the fabric of this club, so it feels somewhat incumbent on us to recognise this in a manner that is befitting to the man." As well as his role in Liverpool's golden era in the 1970s and 1980s, Dalglish also received plaudits for supporting victims' families after 96 fans died in the 1989 Hillsborough stadium disaster. Anfield has two sets of gates dedicated to former managers - the (Bill) Shankly Gates and (Bob) Paisley Gates - but none of its stands currently carries the name of an individual. 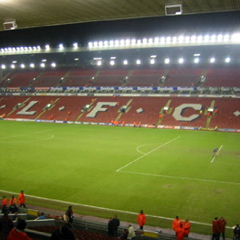 The Kenny Dalglish Stand sits across the pitch from Anfield's giant Main Stand, which was reopened last year after work to increase its capacity by 8 500 seats.